The green flag of the Libyan Arab Jamahiriya was the only national flag in the world with just one colour and no other features: the colour green, which represented Islam and Gaddafi's Third International Theory, outlined in The Green Book . During the 1980s and 1990s, Gaddafi, in alliance with the Eastern Bloc and Fidel Castro's Cuba, openly supported rebel movements like Nelson Mandela's African National Congress, the Palestine Liberation Organization, the Irish Republican Army and the Polisario Front (Western Sahara). Gaddafi's government was either known to be or suspected of participating in or aiding terrorist acts by these and other proxy forces. Additionally, Gaddafi undertook several invasions of neighboring states in Africa, notably Chad in the 1970s and 1980s. All of his actions led to a deterioration of Libya's foreign relations with several countries, mostly Western states,  and culminated in the 1986 United States bombing of Libya. Gaddafi defended his government's actions by citing the need to support anti-imperialist and anti-colonial movements around the world. Notably, Gaddafi supported anti-Zionist, pan-Africanist and black civil rights movements. Gaddafi's behavior, often erratic, led some outsiders to conclude that he was not mentally sound, a claim disputed by the Libyan authorities and other observers close to Gaddafi. Despite receiving extensive aid and technical assistance from the Soviet Union and its allies, Gaddafi retained close ties to pro-American governments in Western Europe, largely by incentivising Western oil companies with promises of access to lucrative Libyan energy sectors. After the 9/11 attacks, strained relations between Libya and the West were mostly normalised, and sanctions against the country relaxed, in exchange for Libyan efforts to shrink its nuclear program. In early 2011, a civil war broke out in the context of the wider "Arab Spring". The rebel anti-Gaddafi forces formed a committee named the National Transitional Council on 27 February 2011. It was meant to act as an interim authority in the rebel-controlled areas. After killings by government forces  in addition to those by the rebel forces,  a multinational coalition led by NATO forces intervened on 21 March 2011 in support of the rebels. The International Criminal Court issued an arrest warrant against Gaddafi and his entourage on 27 June 2011. Gaddafi's government was overthrown in the wake of the fall of Tripoli to the rebel forces on 20 August 2011, although pockets of resistance held by forces in support of Gaddafi's government held out for another two months, especially in Gaddafi's hometown of Sirte, which he declared the new capital of Libya on 1 September 2011. The fall of the last remaining cities under pro-Gaddafi control and Sirte's capture on 20 October 2011, followed by the subsequent killing of Gaddafi, marked the end of the Libyan Arab Jamahiriya. The anti-Gaddafi forces were Libyan groups that opposed and militarily defeated the government of Muammar Gaddafi, killing him in the process. 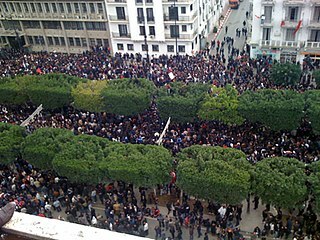 These opposition forces included organized and armed militia groups, participants in the Libyan Civil War, Libyan diplomats who switched their allegiance from the Gaddafi-led government, and Libyan military units that switched sides to support the protestors. The name of Libya was changed several times during Gaddafi's tenure as leader. At first, the name was the Libyan Arab Republic. In 1977, the name was changed to Socialist People's Libyan Arab Jamahiriya. Jamahiriya was a term coined by Gaddafi,  usually translated as "state of the masses". 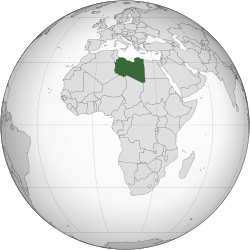 The country was renamed again in 1986 as the Great Socialist People's Libyan Arab Jamahiriya, after the 1986 United States bombing of Libya. The 1986 United States bombing of Libya, code-named Operation El Dorado Canyon, comprised air strikes by the United States against Libya on Tuesday, the 15 April 1986. The attack was carried out by the U.S. Air Force, U.S. Navy and U.S. Marine Corps via air strikes, in retaliation for the 1986 West Berlin discotheque bombing. There were 40 reported Libyan casualties, and one U.S. plane was shot down. One of the claimed Libyan deaths was of a baby girl, reported to be Muammar Gaddafi's daughter, Hana Gaddafi. However, there were doubts as to whether she was really killed, or whether she really even existed. Nasserism is a socialist Arab nationalist political ideology based on the thinking of Gamal Abdel Nasser, one of the two principal leaders of the Egyptian revolution of 1952 and Egypt's second President. Spanning the domestic and international spheres, it combines elements of Arab socialism, republicanism, nationalism, anti-imperialism, developing world solidarity and international non-alignment. In the 1950s and 1960s, Nasserism was amongst the most potent political ideologies in the Arab world. This was especially true following the Suez Crisis of 1956, the political outcome of which was seen as a validation of Nasserism and a tremendous defeat for Western imperial powers. During the Cold War, its influence was also felt in other parts of Africa and the developing world, particularly with regard to anti-imperialism and non-alignment. The Free Officers Movement, which claimed credit for carrying out the coup, was headed by a twelve-member directorate that designated itself the Revolutionary Command Council (RCC). This body constituted the Libyan government after the coup. In its initial proclamation on 1 September,  the RCC declared the country to be a free and sovereign state called the Libyan Arab Republic, which would proceed "in the path of freedom, unity, and social justice, guaranteeing the right of equality to its citizens, and opening before them the doors of honorable work." The rule of the Turks and Italians and the "reactionary" government just overthrown were characterized as belonging to "dark ages", from which the Libyan people were called to move forward as "free brothers" to a new age of prosperity, equality, and honor. The Free Officers Movement was renamed "Arab Socialist Union" (ASU) in 1971, modeled after Egypt's Arab Socialist Union, and made the sole legal party in Gaddafi's Libya. It acted as a "vehicle of national expression", purporting to "raise the political consciousness of Libyans" and to "aid the RCC in formulating public policy through debate in open forums". Trade unions were incorporated into the ASU and strikes outlawed. The press, already subject to censorship, was officially conscripted in 1972 as an agent of the revolution. Italians and what remained of the Jewish community were expelled from the country and their property confiscated in October 1970. While the other Arab nations lifted their oil embargoes on 18 March 1974,  the Gaddafi regime refused to do so. As a consequence of such policies, Libya's oil production declined by half between 1970 and 1974, while revenues from oil exports more than quadrupled. Production continued to fall, bottoming out at an eleven-year low in 1975 at a time when the government was preparing to invest large amounts of petroleum revenues in other sectors of the economy. Thereafter, output stabilized at about two million barrels per day. 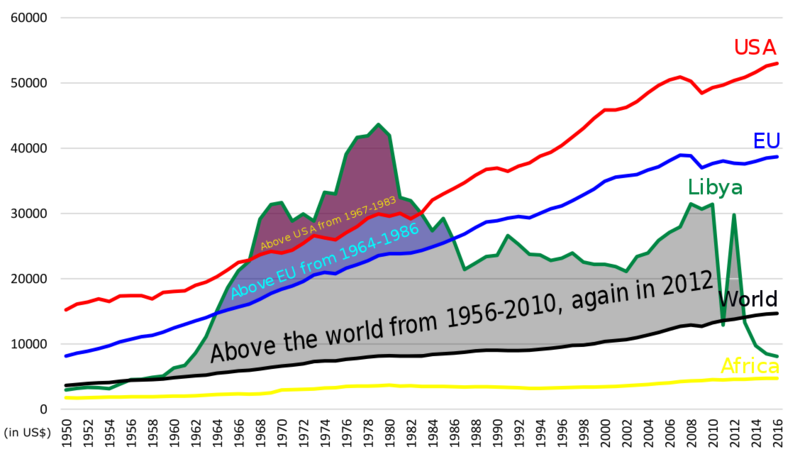 Production and hence income declined yet again in the early 1980s because of the high price of Libyan crude and because recession in the industrialized world reduced demand for oil from all sources. People's committees were established in such widely divergent organizations as universities, private business firms, government bureaucracies, and the broadcast media. Geographically based committees were formed at the governorate, municipal, and zone (lowest) levels. Seats on the people's committees at the zone level were filled by direct popular election; members so elected could then be selected for service at higher levels. By mid-1973 estimates of the number of people's committees ranged above 2,000. In the scope of their administrative and regulatory tasks and the method of their members' selection, the people's committees purportedly embodied the concept of direct democracy that Gaddafi propounded in the first volume of The Green Book , which appeared in 1976. The same concept lay behind proposals to create a new political structure composed of "people's congresses." The centerpiece of the new system was the General People's Congress (GPC), a national representative body intended to replace the RCC. On July 21, 1977, there were first gun battles between troops on the border, followed by land and air strikes. Relations between the Libyan and the Egyptian government had been deteriorating ever since the end of Yom Kippur War from October 1973, due to Libyan opposition to President Anwar Sadat's peace policy as well as the breakdown of unification talks between the two governments. There is some proof that the Egyptian government was considering a war against Libya as early as 1974. On February 28, 1974, during Henry Kissinger's visit to Egypt, President Sadat told him about such intentions and requested that pressure be put on the Israeli government not to launch an attack on Egypt in the event of its forces being occupied in war with Libya. In addition, the Egyptian government had broken its military ties with Moscow, while the Libyan government kept that cooperation going. The Egyptian government also gave assistance to former RCC members Major Abd al Munim al Huni and Omar Muhayshi, who unsuccessfully tried to overthrow Muammar Gaddafi in 1975, and allowed them to reside in Egypt. During 1976 relations were ebbing, as the Egyptian government claimed to have discovered a Libyan plot to overthrow the government in Cairo. On January 26, 1976, Egyptian Vice President Hosni Mubarak indicated in a talk with the US Ambassador Hermann Eilts that the Egyptian government intended to exploit internal problems in Libya to promote actions against Libya, but did not elaborate. On July 22, 1976, the Libyan government made a public threat to break diplomatic relations with Cairo if Egyptian subversive actions continued. On August 8, 1976, an explosion occurred in the bathroom of a government office in Tahrir Square in Cairo, injuring 14, and the Egyptian government and media claimed this was done by Libyan agents. The Egyptian government also claimed to have arrested two Egyptian citizens trained by Libyan intelligence to perform sabotage within Egypt. On August 23, an Egyptian passenger plane was hijacked by persons who reportedly worked with Libyan intelligence. They were captured by Egyptian authorities in an operation that ended without any casualties. In retaliation for accusations by the Egyptian government of Libyan complicity in the hijacking, the Libyan government ordered the closure of the Egyptian Consulate in Benghazi. On July 24, the combatants agreed to a ceasefire under the mediation of the President of Algeria Houari Boumediène and the Palestine Liberation Organization leader Yasser Arafat. On 2 March 1977, the General People's Congress (GPC), at Gaddafi's behest, adopted the "Declaration of the Establishment of the People's Authority"   and proclaimed the Socialist People's Libyan Arab Jamahiriya (Arabic : الجماهيرية العربية الليبية الشعبية الاشتراكية‎  al-Jamāhīrīyah al-'Arabīyah al-Lībīyah ash-Sha'bīyah al-Ishtirākīyah). In the official political philosophy of Gaddafi's state, the "Jamahiriya" system was unique to the country, although it was presented as the materialization of the Third International Theory, proposed by Gaddafi to be applied to the entire Third World. The GPC also created the General Secretariat of the GPC, comprising the remaining members of the defunct Revolutionary Command Council, with Gaddafi as general secretary, and also appointed the General People's Committee, which replaced the Council of Ministers, its members now called secretaries rather than ministers. Jamahiriya (Arabic : جماهيرية‎jamāhīrīyah) is an Arabic term generally translated as "state of the masses"; Lisa Anderson  has suggested "peopledom" or "state of the masses" as a reasonable approximations of the meaning of the term as intended by Gaddafi. The term does not occur in this sense in Muammar Gaddafi's Green Book of 1975. The nisba-adjective jamāhīrīyah ("mass-, "of the masses") occurs only in the third part, published in 1981, in the phrase إن الحركات التاريخية هي الحركات الجماهيرية (Inna al-ḥarakāt at-tārīkhīyah hiya al-ḥarakāt al-jamāhīrīyah), translated in the English edition as "Historic movements are mass movements". The word jamāhīrīyah was derived from jumhūrīyah , which is the usual Arabic translation of "republic". It was coined by changing the component jumhūr — "public" — to its plural form, jamāhīr — "the masses". Thus, it is similar to the term People's Republic. It is often left untranslated in English, with the long-form name thus rendered as Great Socialist People's Libyan Arab Jamahiriya. However, in Hebrew, for instance, jamāhīrīyah is translated as "קהילייה" (qehiliyáh), a word also used to translate the term "Commonwealth" when referring to the designation of a country. After weathering the 1986 U.S. bombing by the Reagan administration, Gaddafi added the specifier "Great" (العظمىal-'Uẓmá) to the official name of the country. Gaddafi as permanent "Leader of the Revolution"
The "Jamahiriya sector" was overseen by the "revolutionary sector", headed by Gaddafi as "Leader of the Revolution" (Qā'id)  and the surviving members of the Revolutionary Command Council, which held office owing to their role in the 1969 coup and were therefore not subject to election. They oversaw the "revolutionary committees", which were nominally grass-roots organizations that helped keep the people engaged. As a result, although Gaddafi held no formal government office after 1979, he retained control of the government and the country. [ citation needed ] Gaddafi also remained supreme commander of the armed forces. In 1972, Gaddafi created the Islamic Legion as a tool to unify and Arabize the region. The priority of the Legion was first Chad, and then Sudan. In Darfur, a western province of Sudan, Gaddafi supported the creation of the Arab Gathering (Tajammu al-Arabi), which according to Gérard Prunier was "a militantly racist and pan-Arabist organization which stressed the 'Arab' character of the province." The two organizations shared members and a source of support, and the distinction between them is often ambiguous. Gaddafi reportedly spent hundreds of millions of the government's money on training and arming Sandinistas in Nicaragua. Daniel Ortega, the President of Nicaragua, was his ally. Inspiration for the unrest is attributed to the uprisings in Tunisia and Egypt, connecting it with the wider Arab Spring. On 22 February, The Economist described the events as an "uprising that is trying to reclaim Libya from the world's longest-ruling autocrat." Gaddafi had referred to the opposition variously as "rats", "cockroaches", and "drugged kids" and accused them of being part of al-Qaeda. In the east, the National Transitional Council was established in Benghazi. Gaddafi's son, Khamis, controlled the well-armed Khamis Brigade and alleged to possess large number of mercenaries. Some Libyan officials had sided with the protesters and requested help from the international community to bring an end to the massacres of civilians. The government in Tripoli had lost control of half of Libya by the end of February,   but as of mid-September Gaddafi remained in control of several parts of Fezzan. On 21 September, the forces of NTC captured Sabha, the largest city of Fezzan, reducing the control of Gaddafi to limited and isolated areas. Libya's history covers its rich mix of ethnic groups added to the indigenous Berber tribes. Berbers have been present throughout the entire history of the country. For most of its history, Libya has been subjected to varying degrees of foreign control, from Europe, Asia, and Africa. 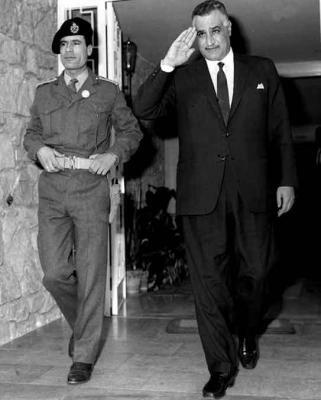 The modern history of independent Libya began in 1951. The Arab Islamic Republic was a proposed unification of Tunisia and Libya in 1974, agreed upon by Libyan head of state Muammar Gaddafi and Tunisian President Habib Bourguiba. Additional countries — Morocco and Algeria — were later included in the proposal, which was never implemented. Human rights in Libya is the record of human rights upheld and violated in various stages of Libya's history. The Kingdom of Libya, from 1951 to 1969, was heavily influenced and educated by the British and Y.R.K companies. Under the King Libya had a constitution. The kingdom, however, was marked by a feudal regime, where Libya had a low literacy rate of 10%, a low life expectancy of 57 years, and 40% of the population lived in shanties, tents, or caves. Illiteracy and homelessness were chronic problems during this era, when iron shacks dotted many urban centres on the country. The Libyan Revolutionary Command Council was the twelve-person governing body that ruled the Libyan Arab Republic from 1969 to 1977. Its chairman was Muammar Gaddafi, who had the most influence. Moussa Muhammad Koussa is a Libyan political figure and diplomat, who held several high-profile positions in the Libyan government, lastly as Minister of Foreign Affairs from March 2009, into the Libyan Civil War, when he resigned his position on 30 March 2011. The Warfalla is a tribe that resides in the west of Libya, in the town of Bani Walid, their stronghold. Usually estimated to be Libya’s largest tribe with up to one million of the total population of about 6 million people, the Warfalla historically inhabited the area bounded by the cities of Bani Walid, Sirte, and Benghazi as well as the town of Sabha. The Brotherly Leader and Guide of the Revolution was an unofficial title held by former Libyan leader Muammar Gaddafi, who claimed to be merely a symbolic figurehead of the country's official governance structure. However, critics have long described him as a demagogue, referring to his position as the de facto former political office, despite the Libyan state's denial of him holding any power. From 1969 to early 2011, the politics of Libya were determined de facto by Muammar Gaddafi, who had been in power since his overthrow of the Kingdom of Libya in 1969. The Cultural Revolution in Libya was a period of political and social change in Libya. It started with Gaddafi's declaration of a cultural revolution during a speech in Zuwara on 15 April 1973. This came after increasing tensions between Gaddafi and his colleagues in the Revolutionary Command Council (RCC) had led him to agree to step down. Gaddafi had told the RCC that he would announce his resignation to the people at the Zuwara speech, but he instead surprised them with his declaration of the Cultural Revolution. By the end of the Cultural Revolution period, Gaddafi was the uncontested leader of Libya. 1 2 "Libya: History". GlobalEDGE (via Michigan State University). Retrieved 14 August 2011. ↑ "Housing". Encyclopædia Britannica . Retrieved 14 August 2011. ↑ "African Countries by GDP Per Capita > GDP Per Capita (most recent) by Country". NationMaster. Archived from the original on 16 July 2011. Retrieved 24 July 2011. ↑ "Comparative Criminology – Libya". Crime and Society. Archived from the original on 7 August 2011. Retrieved 24 July 2011. ↑ Genugten, Saskia van (18 May 2016). Libya in Western Foreign Policies, 1911–2011. Springer. p. 139. ISBN 9781137489500. ↑ Crawford, Alex (23 March 2011). "Evidence Of Massacre By Gaddafi Forces". Sky News. Archived from the original on 19 July 2012. Retrieved 25 October 2011. ↑ McGreal, Chris (30 March 2011). "Undisciplined Libyan rebels no match for Gaddafi's forces". The Guardian. ISSN 0261-3077 . Retrieved 29 April 2017. ↑ "Western nations step up efforts to aid Libyan rebels". Washington Post. Retrieved 29 April 2017. ↑ "America's secret plan to arm Libya's rebels". The Independent. 7 March 2011. Retrieved 29 April 2017. ↑ "France sent arms to Libyan rebels". Washington Post. Retrieved 29 April 2017. ↑ "Libya crisis: Col Gaddafi vows to fight a 'long war'". BBC News. 1 September 2011. 1 2 3 4 5 "Libya - Qadhafi" . Retrieved 16 May 2016. ↑ "Libya – Qadhafi". Countrystudies.us. 11 June 1970. Retrieved 15 September 2013. 1 2 3 "Significant Events in U.S.-Libyan Relations". 2001-2009.state.gov. Retrieved 15 September 2013. ↑ "Transcript of talk between Henry Kissinger and Golda Meir, March 1, 1974" (PDF). Archived from the original (PDF) on 22 June 2012. Retrieved 2012-06-24. ↑ "Hermann Eilts to Department of State, January 25, 1976" . Retrieved 9 June 2011. ↑ "Robert Carle (US Embassy in Tripoli) to Department of State, July 22, 1976" . Retrieved 9 June 2011. ↑ "Hermann Eilts (US Ambassador to Egypt) to Department of State, August 9, 1976" . Retrieved 9 June 2011. ↑ "Hermann Eilts to Department of State, August 11, 1976" . Retrieved 9 June 2011. ↑ "Herman Eilts to Secretary of State, August 25, 1976" . Retrieved 9 June 2011. ↑ "Anti-Gadhafi forces take over port in Sirte". CNN. 27 September 2011. Archived from the original on 22 September 2011. ↑ General People's Congress declaration (2 March 1977) at EMERglobal Lex for the Edinburgh Middle East Report. Retrieved 31 March 2010. ↑ "ICL - Libya - Declaration on the Establishment of the Authority of the People" . Retrieved 16 May 2016. ↑ Protesters Die as Crackdown in Libya Intensifies, The New York Times , 20 February 2011; accessed 20 February 2011. 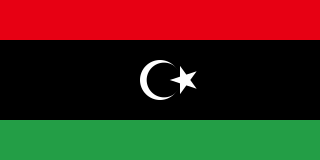 ↑ "Libya – The Socialist People's Libyan Arab Jamahiriya". Countrystudies.us. Retrieved 15 September 2013. ↑ Gadaffi's full title was "Brotherly Leader and Guide to the First of September Great Revolution of the Great Socialist People's Libyan Arab Jamahiriya". 1 2 3 4 5 6 7 8 Eljahmi, Mohamed (2006). "Libya and the U.S.: Gaddafi Unrepentant". Middle East Quarterly . ↑ "BBC Info on Trans-Sahara Water Pipelines". BBC News. ↑ Luxner, Larry (October 2010). "Libya's 'Eighth Wonder of the World'". BNET (via FindArticles). 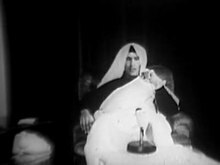 ↑ "Gaddafi: Emancipator of women?". IOL. Retrieved 29 March 2016. ↑ Prunier, Gérard. Darfur – A 21st Century Genocide. p. 44. ↑ "judgment of the ICJ of 13 February 1994" (PDF). Archived from the original (PDF) on 31 December 2004. Retrieved 8 January 2007. ↑ "Eugene Register-Guard - Google News Archive Search" . Retrieved 16 May 2016. ↑ Prunier, Gérard. Darfur: The Ambiguous Genocide. p. 45. 1 2 Nolutshungu, S. p. 220. ↑ Thomson, J. Mercenaries, Pirates and Sovereigns. p. 91. ↑ Prunier, G. pp. 61–65. ↑ de Waal, Alex (5 August 2004). "Counter-Insurgency on the Cheap". London Review of Books . 26 (15). 1 2 "Libya Has Trouble Building the Most Deadly Weapons". The Risk Report Volume 1 Number 10 (December 1995). Archived from the original on 20 April 2013. 1 2 3 4 Khalil, Tahier. "Gaddafi made an enormest effort for Bhutto's release". Tahir Khalil of Jang Media Group. Archived from the original on 21 October 2011. Retrieved 21 October 2011. ↑ "Lifetimesgroup News" . Retrieved 16 May 2016. ↑ "Libyan Chemical Weapons". GlobalSecurity.org. ↑ "Libya Chemical Weapons Destruction Costly". Arms Control Association. ↑ Davis, Brian Lee (1990). Qaddafi, Terrorism, and the Origins of the U.S. Attack on Libya. p. 141. 1 2 Bodansky, Yossef (1993). Target America & the West: Terrorism Today. New York: S.P.I. Books. pp. 301–303. ISBN 978-1-56171-269-4. ↑ Kelsey, Tim; Koenig, Peter (20 July 1994). "Libya will not arm IRA again, Gaddafi aide says". The Independent. London. Retrieved 1 September 2011. 1 2 3 4 5 6 Davis, Brian Lee. Qaddafi, Terrorism, and the Origins of the U.S. Attack on Libya. p. 183. ↑ Amin, Idi; Turyahikayo-Rugyema, Benoni (1998). Idi Amin Speaks – An Annotated Selection of His Speeches. 1 2 Stanik, Joseph T. (2003). El Dorado Canyon – Reagan's Undeclared War with Qaddafi. 1 2 Davis, Brian Lee (1990). Qaddafi, Terrorism, and the Origins of the U.S. Attack on Libya. p. 16. 1 2 3 Farah, Douglas (4 March 2011). "Harvard for Tyrants". Foreign Policy . ↑ Max Fisher, 'The last great liberator’: Why Mandela made and stayed friends with dictators, Washington Post (December 10, 2013). 1 2 3 Chothia, Farouk (21 October 2011). "What does Gaddafi's death mean for Africa?". BBC News. Retrieved 29 October 2011. ↑ Nwonwu, Fred (27 October 2011). "Remembering Gaddafi the hero". Daily Times of Nigeria . Archived from the original on 17 June 2013. Retrieved 29 October 2011. ↑ "Harvard for Tyrants – By Douglas Farah". Foreign Policy. Retrieved 15 September 2013. 1 2 3 James Day (15 March 2011). "Revealed: Colonel Gaddafi's School for Scoundrels". Metro. ↑ "How the Mighty Are Falling". The Economist . 5 July 2007. Retrieved 17 July 2007. ↑ "Gaddafi: Africa's king of kings". London: BBC News. 29 August 2008. Retrieved 14 February 2010. ↑ "Uganda bars Gaddafi kings' forum". London: BBC News. 13 January 2009. Retrieved 14 February 2010. ↑ Malone, Barry (2 February 2009). "Gaddafi pushes for union after election to head AU". Reuters UK. Reuters. Retrieved 2 September 2011. ↑ "Gaddafi vows to push Africa unity". London: BBC News. 2 February 2009. Retrieved 3 February 2009. ↑ "Saving the world economy from Gaddafi". Russia Today . 5 May 2011. Retrieved 29 October 2011. ↑ "'High-class terrorists running US, UK and France'". Russia Today . 21 October 2011. Retrieved 29 October 2011. 1 2 3 Davis, Brian Lee. Qaddafi, Terrorism, and the Origins of the U.S. Attack on Libya. p. 182. ↑ RTÉ Documentary: The Navy. ↑ Bell, Bowyer. p. 398. 1 2 Geoffrey Leslie Simons. Libya: the struggle for survival. p. 281. 1 2 3 4 5 6 "A Rogue Returns". Australia/Israel & Jewish Affairs Council. February 2003. Archived from the original on 1 March 2003. ↑ "Libyan Terrorism: The Case Against Gaddafi". The Contemporary Review . 1 December 1992. 1 2 Niksch, Larry (25 January 2002). "Abu Sayyaf: Target of Philippine-U.S. Anti-Terrorism Cooperation" (PDF). CRS Report for Congress. Federation of American Scientists. ↑ Stanik, Joseph T. El Dorado Canyon: Reagan's Undeclared War with Qaddafi. ↑ President Ronald Reagan (10 March 1982). "Proclamation 4907 – Imports of Petroleum". United States Office of the Federal Register. ↑ Combs, Cindy C.; Slann, Martin W. Encyclopedia of Terrorism. ↑ Rayner, Gordon (28 August 2010). "Yvonne Fletcher Killer May Be Brought to Justice". The Daily Telegraph . London. 1 2 St. John; Ronald Bruce (1 December 1992). "Libyan Terrorism: The Case Against Gaddafi". The Contemporary Review . ↑ Seale, Patrick (1992). Abu Nidal: A Gun for Hire. Hutchinson. p. 245. ↑ Davie, Brian Lee. Qaddafi, Terrorism, and the Origins of the U.S. Attack on Libya. p. 186. ↑ "Flashback: The Berlin Disco Bombing". BBC News. 13 November 2001. 1 2 3 The Middle East and North Africa 2003 (2002). Eur. p. 758. 1 2 3 4 5 "Dictator's Useful Idiots Happy To Take His Money". The Australian . 24 February 2011. ↑ "Qaddafi, Vanessa Redgrave, and Their Adventures". The Weekly Standard . 8 March 2011. ↑ "Indonesia/Aceh (1949-present)". Political Science. University of Eastern Arkansas. Retrieved 7 July 2015. ↑ Stokke, Hugo; Suhrke, Astri; Tostensen, Arne (1997). Human Rights in Developing Countries: Yearbook 1997. The Hague: Kluwer International. p. 241. ISBN 978-90-411-0537-0. ↑ "Being gay under Gaddafi". Gaynz.com. Archived from the original on 2 November 2011. Retrieved 1 September 2011. ↑ Metz, Helen Chapin (1987). "Libya: A Country Study- Education". US Library of Congress. ↑ Arditti, Avi (28 March 2007). "English Teaching in the Arab World: Insights From Iraq and Libya". Voice of America . 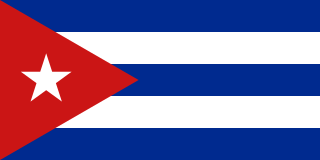 ↑ [ full citation needed ] "A New Flag Flies in the East". The Economist . 24 February 2011. ↑ "Freedom of the Press 2009" (PDF). Freedom House. 2009. Archived from the original (PDF) on 4 August 2011. Retrieved 7 May 2009. ↑ Robertson, Cameron; Khalili, Mustafa; Mahmood, Mona (18 July 2011). "Libya Archive Reveals Pictorial History of Gaddafi's Brutal Reign". The Guardian. London. Retrieved 19 July 2011. ↑ [ full citation needed ] The New York Times . 20 August 1981. ↑ Bright, Martin (28 March 2004). "Gadaffi Still Hunts 'Stray Dogs' in UK". The Guardian . London. ↑ "Files show MI6, CIA ties to Libya: reports". Sydney Morning Herald. 4 September 2011. Retrieved 4 September 2011. ↑ Spencer, Richard (3 September 2011). "Libya: secret dossier reveals Gaddafi's UK spy links". The Telegraph. London. Retrieved 3 September 2011. ↑ Martínez, Luis (2007). The Libyan Paradox. Columbia University Press. p. 71. ISBN 978-0-231-70021-4. ↑ Shadid, Anthony (18 February 2011). "Libya Protests Build, Showing Revolts' Limits". The New York Times . Retrieved 22 February 2011. ↑ "Time to Leave – A Correspondent Reports from the Border Between Libya and Egypt". The Economist . 22 February 2011. Retrieved 23 February 2011. ↑ "Gaddafi: 'I Will Not Give Up', 'We Will Chase the Cockroaches'". The Times . 22 February 2011. ↑ Harvey, Benjamin; Mazen, Maram; Derhally, Massoud A. (25 February 2011). "Qaddafi's Grip on Power Weakens on Loss of Territory". Bloomberg . Retrieved 25 February 2011. Qaddafi, speaking by telephone on state television yesterday, blamed the uprising against his 41-year rule on 'drugged kids' and al-Qaeda. ↑ Peter Gwin (31 August 2011). "Former Qaddafi Mercenaries Describe Fighting in Libyan War". The Atlantic. Retrieved 25 June 2012. ↑ [http:// www.economist.com/node/18239888 "Endgame in Tripoli"] Check |url= value (help). The Economist. 24 February 2011. Retrieved 25 June 2012. ↑ "Gaddafi Defiant as State Teeters". Al Jazeera English. 23 February 2011. Retrieved 23 February 2011. ↑ Casey, Nicholas; de Córdoba, José (26 February 2011). "Where Gadhafi's Name Is Still Gold". The Wall Street Journal . ↑ "Security Council Approves 'No-Fly Zone' over Libya, Authorizing 'All Necessary Measures' to Protect Civilians in Libya, By a Vote of Ten For, None Against, with Five Abstentions". United Nations . Retrieved 19 March 2011. ↑ "U.N. no-fly zone over Libya: what does it mean?". ↑ "French Fighter Jets Deployed over Libya". CNN . 19 March 2011. Retrieved 19 March 2011. ↑ "Gunfire, explosions heard in Tripoli". CNN. 20 March 2011. Retrieved 20 March 2011. ↑ "Libya Live Blog – March 19". Al Jazeera. 19 March 2011. Archived from the original on 19 March 2011. Retrieved 19 March 2011. ↑ "UPDATE 4-Libya declares nation liberated after Gaddafi death". Reuters. 23 October 2011. ↑ "Libye: "Mouammar Kadhafi avait choisi la voie suicidaire dès février"" [Libya: "Muammar Gaddafi had chosen the path of suicide in February"]. 20 minutes (in French). 20 October 2011. Retrieved 11 November 2011. Look up Jamahiriya in Wiktionary, the free dictionary.